Leveraging upon the impeccable desires of our customers from across the country, we have been engrossed in offering with a rich and efficients series of Insert Nut. Incorporated in the year of 2007, Siddhivinayak Enterprises has been able to deliver a rich and efficient range of industrial equipment which finds their myriad usage in different industrial chores. 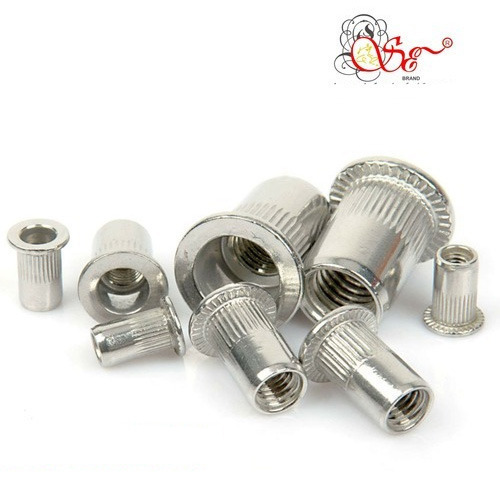 Some of the products in which we have been dealing with compose of Blind Rivet Nuts, Stainless Steel Pop Rivets, Stainless Steel Circlips, Insert Nuts, SS Studs, Dome Bolt, Cotter Pins, Anchor Fasteners, SS Bolts, SS nuts, SS Screws, SS Sockets, SS Washers, Industrial Fasteners, etc. These products are contrived out of a stainless gamut of iron-steel material which leads them to render a very eminent and longer serving life to our customers. Moreover we are engrossed in offering with these products at a very economical and convenient market price to our customers.